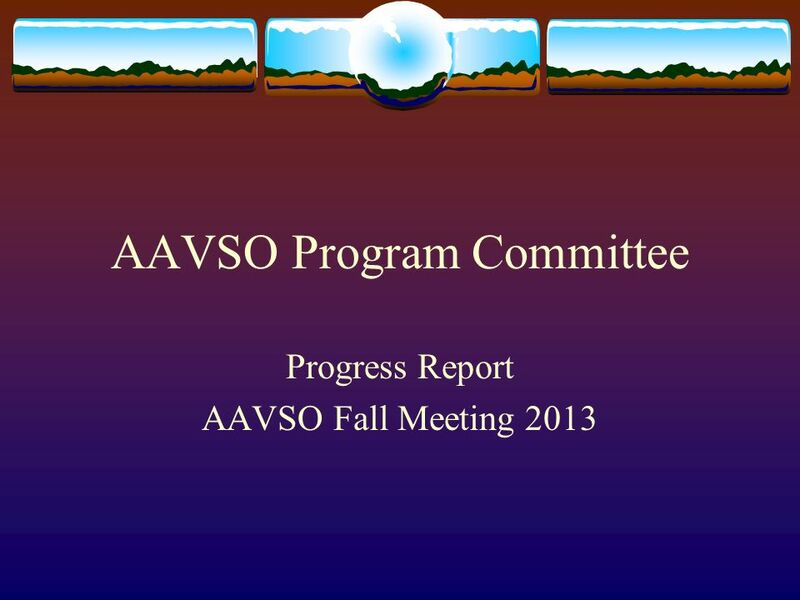 AAVSO Program Committee Progress Report AAVSO Fall Meeting 2013. 5 I. 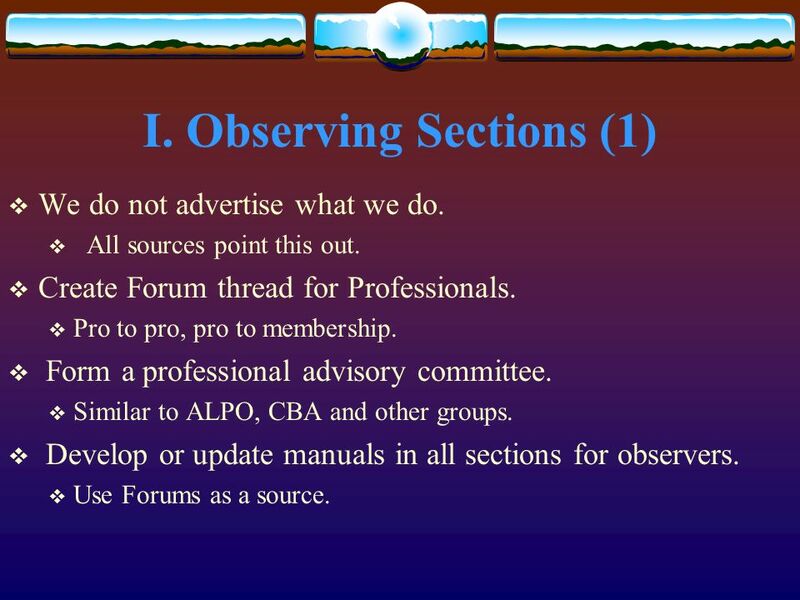 Observing Sections (1) We do not advertise what we do. All sources point this out. Create Forum thread for Professionals. Pro to pro, pro to membership. Form a professional advisory committee. Similar to ALPO, CBA and other groups. 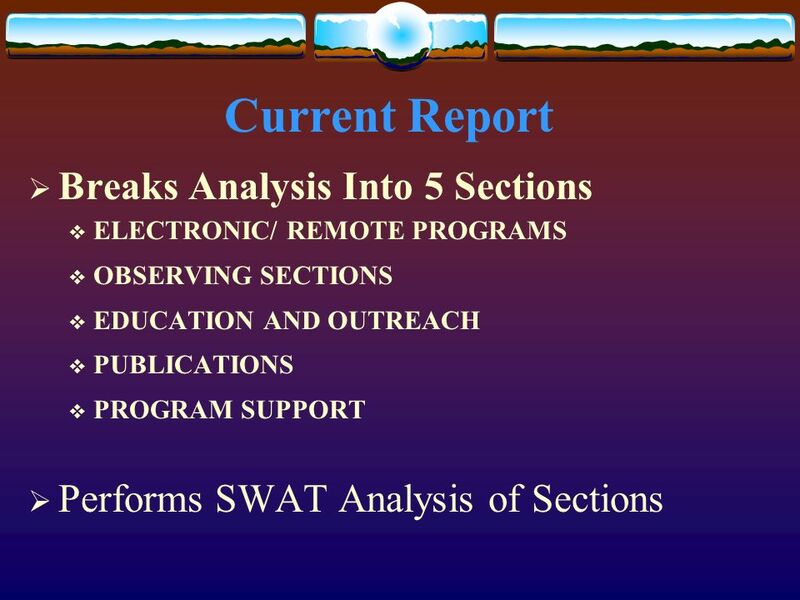 Develop or update manuals in all sections for observers. Use Forums as a source. 6 I. Observing Sections (2) 1. Choice course for QC 2. Highlight sections in AAVSO Newsletter. 3. Switch Bulletin to volunteers. 1. Would save staff time. 4. Keep all sections. Archival of data is crucial for future studies. 7 II. Electronic/Remote Programs Not well advertised. Agreed by all sources. 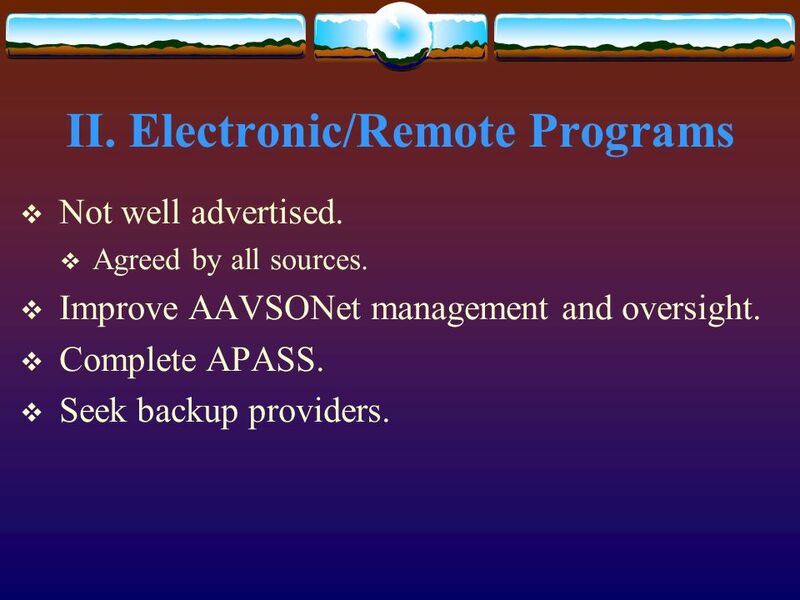 Improve AAVSONet management and oversight. Complete APASS. Seek backup providers. 9 IV. Publications Make format compatible with other journals. Encourage observers to publish in JAAVSO. Enhance scientific rather than historic content. 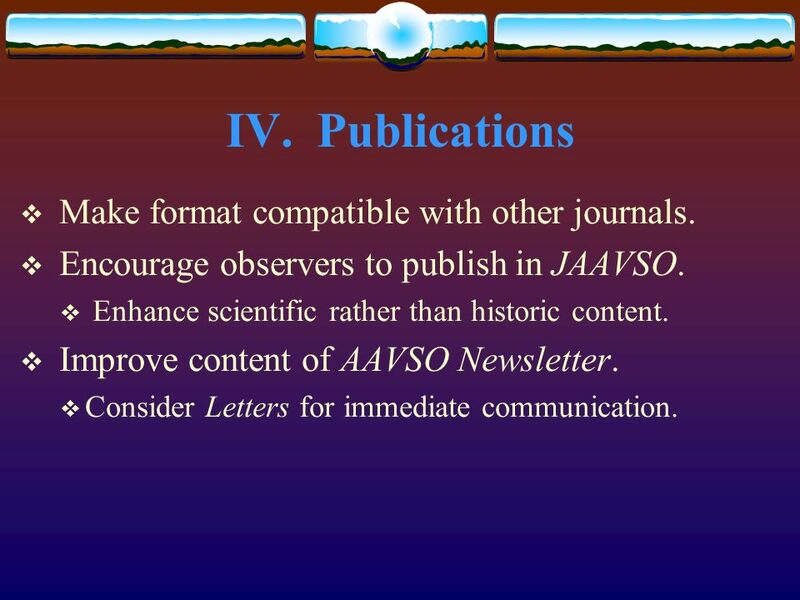 Improve content of AAVSO Newsletter. Consider Letters for immediate communication. 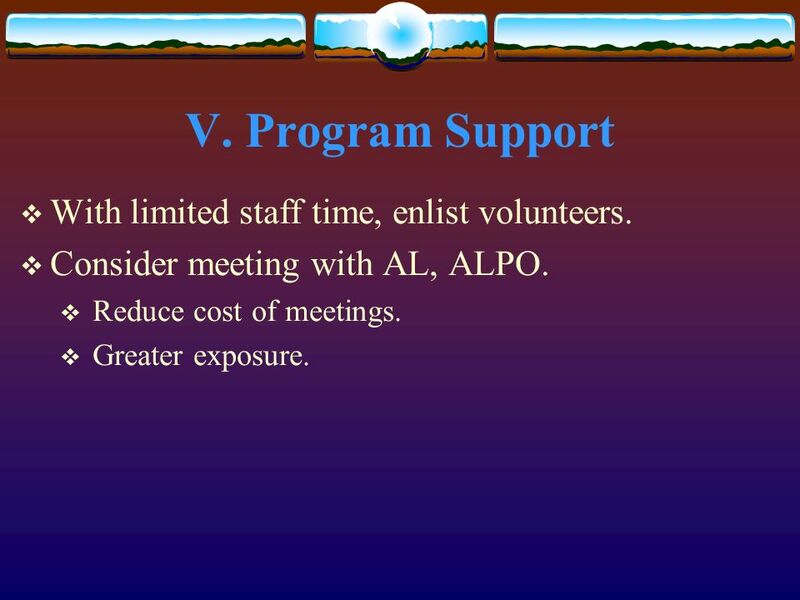 10 V. Program Support With limited staff time, enlist volunteers. Consider meeting with AL, ALPO. Reduce cost of meetings. Greater exposure. 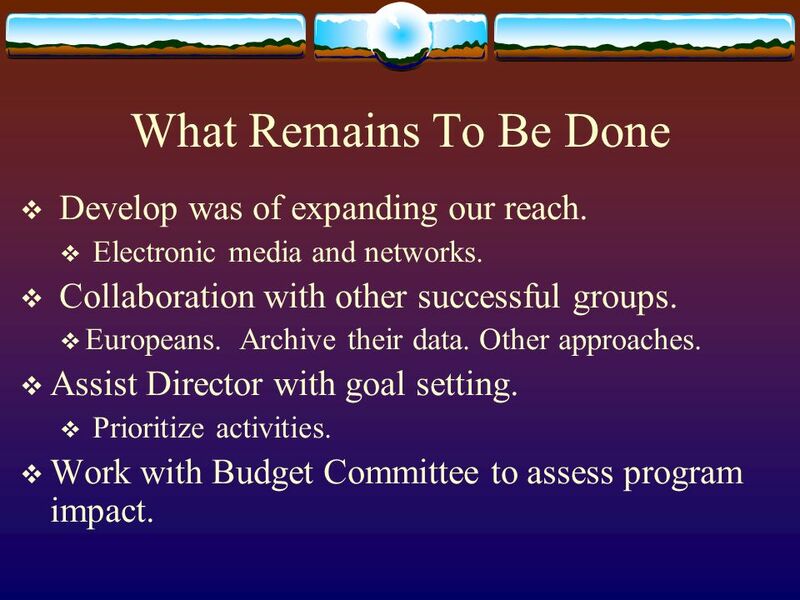 11 What Remains To Be Done Develop was of expanding our reach. Electronic media and networks. Collaboration with other successful groups. Europeans. Archive their data. Other approaches. Assist Director with goal setting. Prioritize activities. Work with Budget Committee to assess program impact. 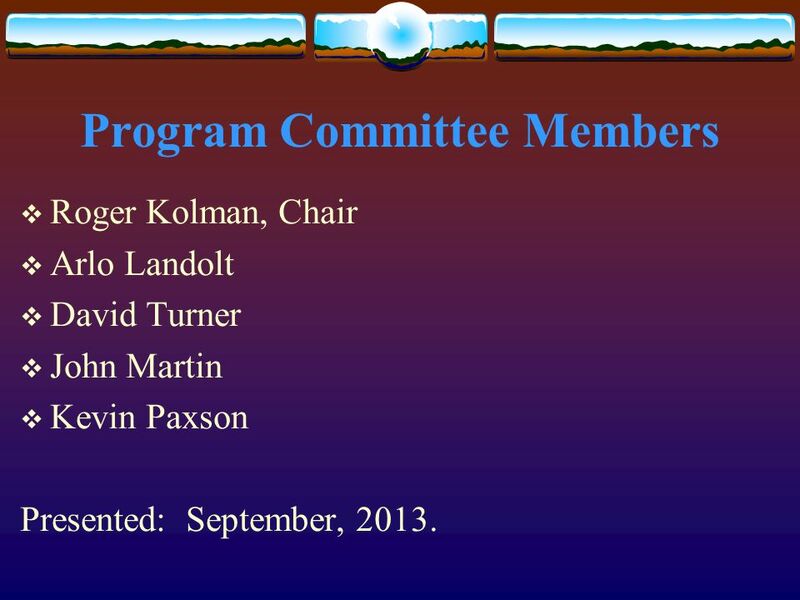 12 Program Committee Members Roger Kolman, Chair Arlo Landolt David Turner John Martin Kevin Paxson Presented: September, 2013. 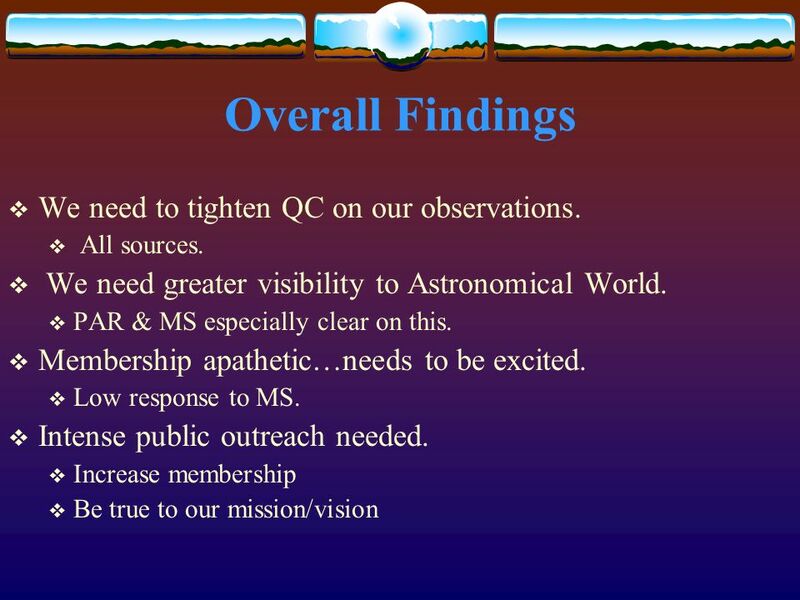 Download ppt "AAVSO Program Committee Progress Report AAVSO Fall Meeting 2013." 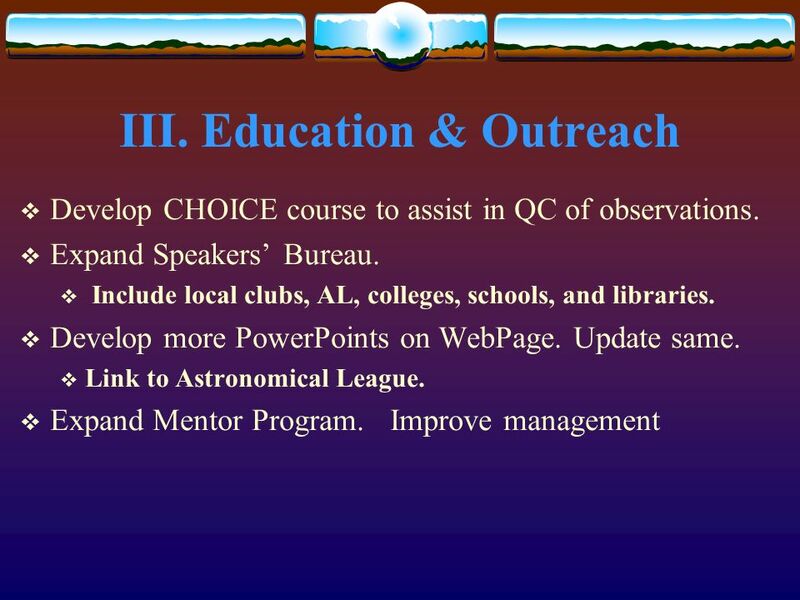 Turning the AAVSO Mission and Vision Into a Strategic Plan Mike Simonsen April 2008 Mike Simonsen April 2008. Guidelines Improve our product Train our observers Spread the word The professionals point of view the big picture and direction. 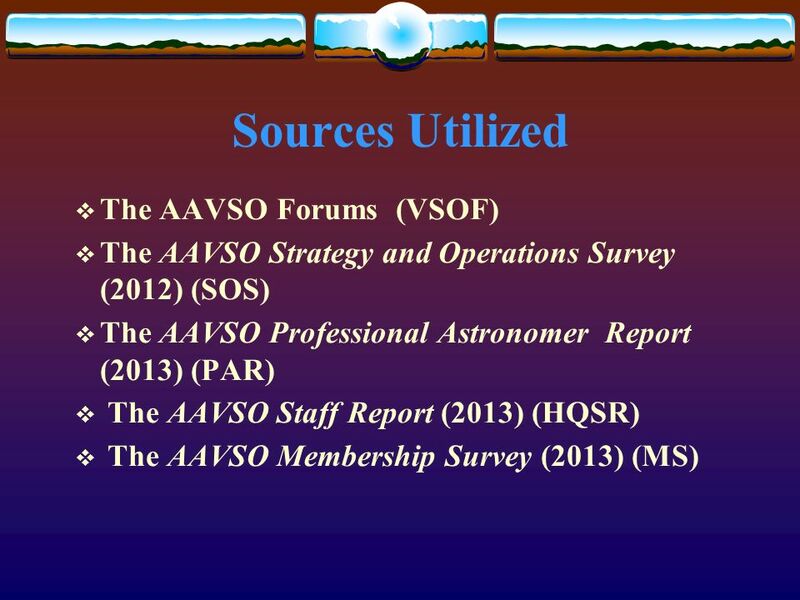 AAVSO Program Committee Progress Report AAVSO Spring Meeting 2013. AAVSO The American Association of Variable Star Observers Cambridge, Massachusetts. A STRATEGIC PLAN. STRATEGIC PLANS ARE NOT INTENDED TO BE PERMANENT GOALS ARE INTENDED TO EVOLVE OVER TIME AS NEEDS ARISE DETERMINE AREAS OF FOCUS SET. A comprehensive plan complied by Ms. Concetta DAlessio, Mr. Thomas Gelok, & Ms. Meghan Kilfeather of the University at Buffalo. DAlessio, Gelok, Kilfeather. Audrey Desjarlais, Signetwork Coordinator Survey Findings SPDG Initiative Goals SPDG Initiative Outcomes. Twenty-ninth session of the Executive Body Geneva, December 2011, Item 12 Global Atmospheric Pollution Forum Brings together regional networks and. Mentoring Forum Discussion, Part II: Deepening Our Understanding of What’s Working February 18, 2014 Excerpts from Surveys #1 and #2 Summary of 9/19/survey. CERL Promotion Working Group Update for Coordinating Committee meeting, Vienna 2015. NATIONAL BUSINESS COALITION ON HEALTH ALL MEMBER MEETING TOWN HALL & STRATEGIC UPDATE Carolyn Pare, Board Chair, National Business Coalition on Health. Community Resource Cultivation Module 3. Start Where You Are Use existing contacts, networks and resources as a starting place for developing your robotics. Blackboard 201 Communication Workshop Barbara Cooper. OCC Faculty Online Coordinator. County of Orange Health Care Agency MEDICAL RESERVE CORPS Sharing The Positives Have You Been Here And Done This In Recruitment.